If you want to book a plush river cruise vacation in America's heartland - say on the Mississippi or Ohio Rivers - you can do it. The American Queen Steamboat Company's website offers as many as 13 river cruises in 2018. Certainly, the 'bourbon cruise,' aboard the lavish American Duchess sounds like fun. Or, maybe next year you can sign up for the nine-day 'Derby Cruise.' And, next year means 2019 because the 2018 cruise is sold out. Maybe the most fun is that passengers themselves will be part of a race: the Kentucky Derby Festival Great Steamboat Race - one of the most iconic events on the Ohio River. You likely can't do that as a passenger anywhere else in the world. If you can't get to the Derby on the American Duchess you can contact American Cruise Lines - they offer an 11-day cruise from Memphis to Pittsburgh, with a stop at Churchill Downs for a VIP racetrack tour. And if you've got plenty of vacation time, perhaps the ACS 22-day Mississippi River excursion, travelling from New Orleans to St. Paul, Minn., is more to your liking. There's plenty of life in the inland river luxury passenger cruising market, and not just on the Mississippi or Ohio. This is an active market in the Northwest, in Florida and certainly in Canada and along the New England coast. Nevertheless, and like an asterisk on a baseball stat, a follow up question always arises: yes, river cruising is alive, but is it alive and well? The sentiment persists that U.S. inland river cruising remains a limited, rather staid product sector. There's always optimism: it's ready to break out, with favorable signs supporting industry growth. This will be the year, or maybe next. This somewhat pessimistic view is based on a sense that U.S. river cruising is still largely characterized by old-school, down-market products, aboard rough faux paddle-wheelers offering more of a sense of a Tom Sawyer adventure than a European style luxury vacation offering an afternoon excursion to the Louvre. Nevertheless, the AQS 2018 Derby Cruise is sold out and its itinerary includes an excursion to the Owensboro (Ky.) Museum of Fine Art. Different museums, but the cultural offering is an important indicator. Separately, however, a third river-based cruise line, Louisiana-based French American Line offers the Louisiane, with 75 suites and staterooms for 150 passengers. But this year FAL won't be offering river tours. That's because the company got a better offer. A spokesperson explained that FAL was close to signing a contract to provide "humanitarian relief in the Caribbean." Another unsettled development for cruise market-watchers revolves around decisions by Viking River Cruises. In 2015 Viking announced plans to build six new vessels, with the first two ready for service in 2017. Unfortunately, in 2016, that schedule was put on hold, bumping possible start up to 2018. Asked for an update, a spokesman replied, "We are actively working with our partners to launch on the Mississippi River, but at this point in time we do not have any details to share regarding product specifics or a launch timeline." For 2018, the river cruise market presents a swirl of indicators. In all likelihood, consumer demand will continue. What's not clear is whether that demand will hopefully expand, finally strong enough to hasten big decisions about expensive new vessels; strong enough to forge new partnerships among operators and ports and possible host cities; strong enough to signal to operators that they need to ramp up their efforts regarding employment and training - from kitchen help to seasoned mariners. River tour stakeholders are optimistic about 2018. They see market conditions in alignment with larger vacation and travel interests. But, the cruise industry is cyclical, closely linked to how well the overall economy is doing and, of course, how well individual consumers judge their own economic position. One favorable sign that's hard to miss: the Dow edging closer to 25,000. New vessels potentially coming on line, soon. Anderson says that at least one company will have four new European-style boats delivered in 2018-19. Beyond this, she stressed the importance of cruise-business networks. Success doesn't just happen. In Vancouver, it took five years to overcome local resistance to a port call by a Columbia River based vessel. Anderson said people just didn't see the extensive local impacts and city government decisions about port modifications were delayed. Eventually a riverfront coalition evolved, one which successfully advocated for the ship's call, a development contributing to a series of port upgrades, including new housing and retail as well as regional benefits: Most of the ship's wine now comes from Northwest wineries. Daniel Beals is advertising and marketing coordinator for St. Lawrence Cruise Lines. Like Anderson, he is optimistic about 2018. His boat carries 66 passengers; 60 percent from the U.S. Americans, he says, like to visit Canada because it's close, familiar and beautiful. "River cruising can still grow throughout North America," he told Marine News, adding, "If people feel confident with money and travel, particularly retirees, it will grow." Another stakeholder, the International Association of Maritime and Port Executives (IAMPE) is a maritime trade group. Captain Jeffrey Monroe is IAMPE's Director of Education and Standards. Monroe said IAMPE's membership is interested in river cruising. "This is an emerging issue," Monroe said. "We include it in our inland waters training program; people are very interested in how this all works." Monroe said that US river cruising faces challenges about how to break out of a historically limited scope, as well as expanding territories and improving quantity and quality of products. Monroe cites two basic factors for market expansion: First, new private-sector investments, eventually driven by bigger, well funded operators. He admits that there is a chicken-and-egg factor that weighs on next steps and timing. He points to Viking as a likely entrant, offering that, "Viking knows how to put these pieces together." Monroe's second point mirrored Cynthia Anderson's comments. There needs to be regional partnerships among all entities involved in river cruises - or efforts to develop cruises, and keep them successful. Regional and market coalitions can make sure all the moving parts work - from tour buses to staging areas to local port officials who will place high value on visits from touring vessels - and work for required infrastructure upgrades. As an example, Monroe cited work being done by Maine stakeholders, including the Maine Port Authority and the City of Portland. Patrick Arnold heads up that cooperative work through his company, Soli DG. Funding comes from the coalition members as well as some public money from state/regional tourist offices. Arnold said that cruise lines look for this regional work because they sell cruises based on a region, not a particular city or singular destination. To the extent the region is attractive, welcoming and can help with logistics, those attributes eventually support growth that brings new ships. Memphis, Tenn., is one city expecting big growth in river cruising. At the heart of the action, American Queen Steamboat Company is headquartered there. The recent move by AQS was in no small part prompted by the city's expanded facilities for riverboat tours, including American Cruise Lines' operations, and, possibly, Viking, as well. Memphis began reconstruction of its Beale Street Landing around the time that AQS was reevaluating its new business plan. "New" is important - and perhaps cautionary - because the company was reorganizing to restart its cruise operations. 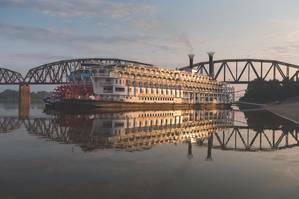 Original plans called for a Mississippi-based operation, but a Mississippi home port made New Orleans to Memphis cruises - the bread and butter of lower Mississippi River cruising - difficult. AQS looked at this logistical problem while observing Memphis' investments in Beale Street, starting around 2013, a broad set of projects eventually costing $45 million. One project included new riverboat landing infrastructure, about the best welcome mat a city could put out. This effort signified commitment, requiring approvals from city officials, a loan from the city, new private investors, and even, at one point, Congressional action to resolve federal commitments made through Marad. But the deal got done. AQS moved to town. Benny Lendermon is president of Memphis' Riverfront Development Corp. It's his assessment that AQS, ACS and Viking are all "incredibly bullish on the future, on the market being there." He predicts Viking will start construction of new boats in 2018. Separately, IAMPE's Jeff Monroe cites the Memphis-AQS project as an example of what it takes to advance river cruising. The infrastructure is important, he says, but insists it's not the whole story. Rather, it's the commitment that this city isn't just any port in a storm. It's the right port, solidifying what will likely be a very lucrative partnership. Riverboat tourists typically aren't business travelers hurrying to a meeting. They are in town for fun, with time and money. For any business expansion, hard assets and a deliberate business plan are central components. Memphis has invested in both. For the operators, there were sold out riverboat cruises in 2017. What does that indicate for 2018? It could be that the market is fully satisfied. Or maybe there are thousands of customers anxious to get in on the fun, if only there was room. The red-hot ferry building industry may have found another sector to help keep it 'moving on down the river.' Looking ahead, Memphis, multiple industry players, and the operators themselves are banking on it.